King St. Elesbaan of Ethiopia, from the Roman Martyrology's entry for October 27th, is also known to history as Kaleb of Axum (ca. A.D. 510-540). During his reign, the Jewish Himyarite king Dhu Nawas of Yemen was massacring Christians and destroying churches. Elesbaan responded by invading the neighboring kingdom and, having conquered Dhu Nawas in battle, ended the persecution and placed a Christian on the Yemenite throne. Soon afterward, Elesbaan was said to have abdicated the kingship of Axum and joined a monastery to devote his life to prayer, where he died in the odor of sanctity. 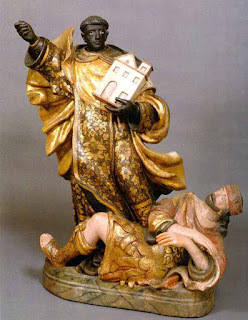 The iconography of St. Elesbaan has lately attracted some scholarly attention for its striking racial undertones in an era when the Atlantic Slave Trade was at its height. 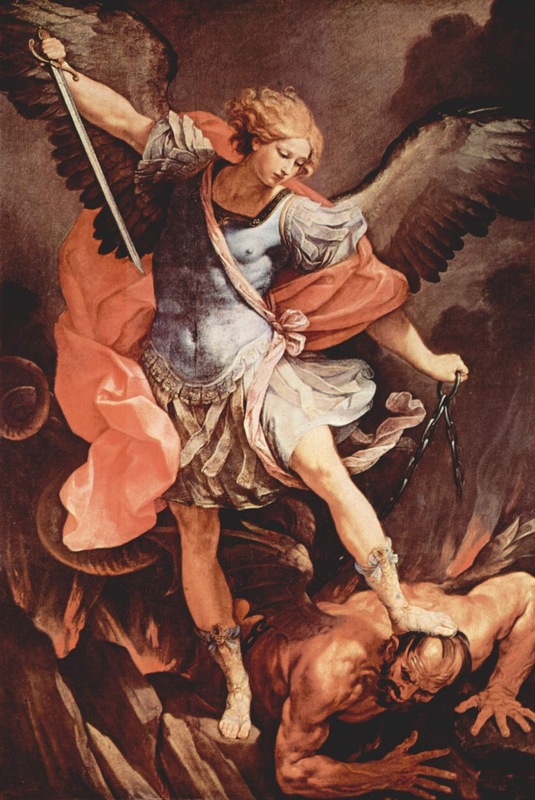 In European societies where slavery was only increasing in scope, his image gave visual form to a sharp counternarrative that seems to have been tolerated and even encouraged within the Church. Elesbaan is traditionally depicted as a dark-skinned African in Carmelite robes, often with a crown nearby to symbolize the office that he abdicated. 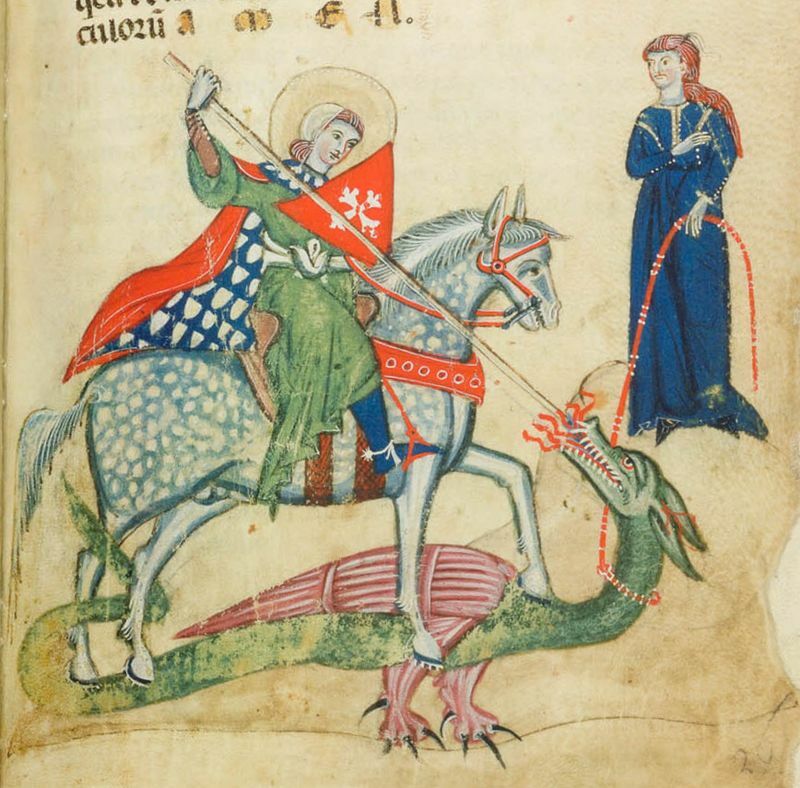 He carries a spear, usually topped by a cross, its tip menacing a vanquished light-skinned king at his feet. In his other arm, Elesbaan typically is shown holding a church to his breast. The racial aspects of Elesbaan's image are dramatic and seem to have been quite purposely dichotomized by the artists. Black Africans had long been a presence in European sacred art, but unlike in, say, depictions of the Epiphany where St. Balthasar's features could serve as a marker for Christian universalism, the historical context of the Elesbaan story was such that any racial distinctions between him and Dhu Nawas must necessarily be placed in stark opposition. A modern viewer trained to see only systematic racism in European culture must surely be confused by the consistency of these images. 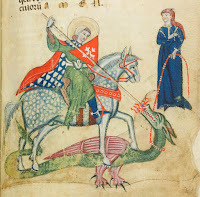 St. Elesbaan is always and very unmistakably cast as the heroic protagonist in these compositions, in a manner that immediately recalls the iconography of St. George and the Dragon or St. Michael and Satan. They drew from a visual vocabulary that Europeans knew from countless depictions over time immemorial. Dhu Nawas, for his part, was compelled in these renderings to act out the humiliation and total vanquishment of the forces of Hell. Like in the United States, where blacks in the South recast the Exodus story as a covert prayer for deliverance, black Catholics in the diaspora would have doubtlessly seen in St. Elesbaan an inspirational as well as politically subversive figure. Quite likely, many white slave-masters would have agreed with that assessment. But here the latter were at a rare disadvantage: Elesbaan was theologically unimpeachable as a canonized saint in the Roman Martyrology, and to argue that he did not deserve veneration or to forbid his image in the post-Tridentine era was to put oneself in the same class as the Protestant heretics. 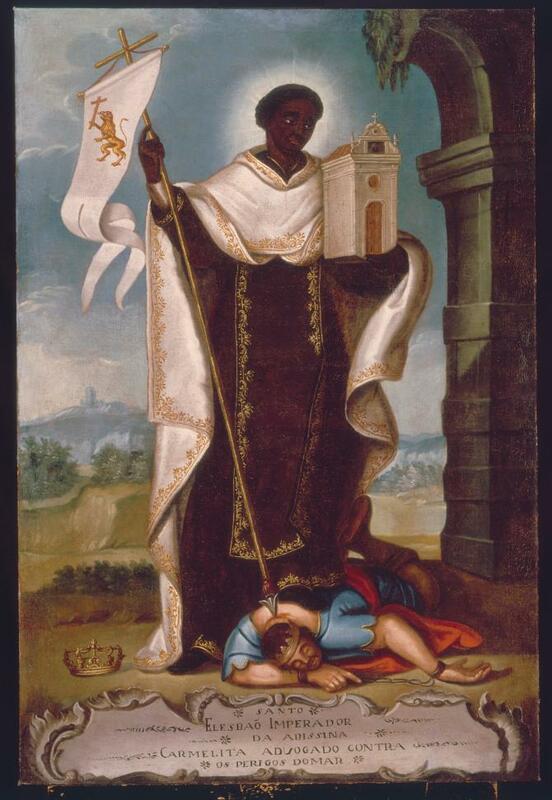 More than that, the life of this Ethiopian proto-crusader embodied all that European Catholic monarchs had claimed to stand for. Elesbaan became one of the revered patron saints of the African diaspora, particularly in Spanish- and Portuguese-speaking areas. Confraternities of black Catholics were organized in his honor, and these often featured African drumming and dancing on his feast days. 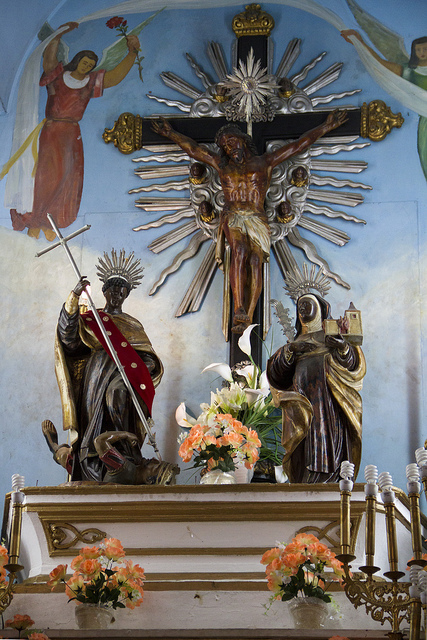 To this day, there are a number of churches under his patronage in Brazil, including a famous one in Rio de Janeiro that prominently displays him atop the high altar together with St. Iphigenia, another revered saint of diaspora Africans. Post-Tridentine Western Catholicism was not the politically hidebound, culturally monolithic entity that we sometimes make it out to be. It was quite capable of making subtle or even not-so-subtle critiques of the politics and culture surrounding it. The saints elevated and revered in an age often contain within their stories the lessons which that particular age most needs to learn—like St. Gianna Beretta Molla in our own. 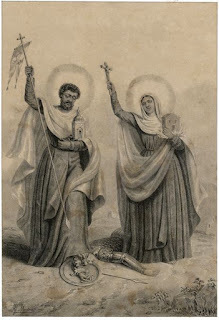 King St. Elesbaan's images are a precious glimpse into the devotional life of what the American historian Cyprian Davis has aptly called "a church in chains." From the cries of the persecuted Church of Yemen all the way to the plaintive spirituals of the cotton fields, these sacred images are part of a long tradition, a living testimony to a Christian people's hope that the bonds of oppression would soon be broken, and that all the beloved children of God would once more walk free upon the land.